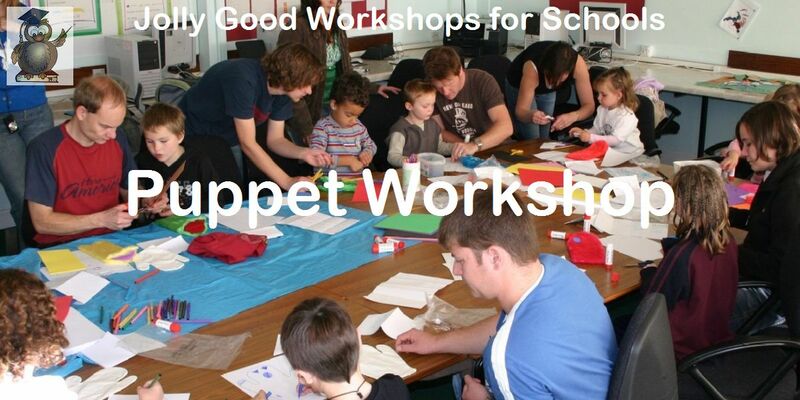 Watch a fantastic puppet show, learn about puppets, make a puppet. 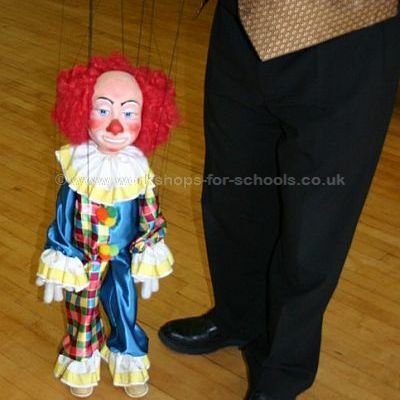 Puppet Day can be linked into various different topics and is useful for for cross-curricular learning. Although mainly booked for Year 1 and 2 children it is perfectly suitable for Year 3 and 4. We do sometimes work with Year 5 and 6 but use an entirely different format. Please contact us if you are looking for something sutable for the upper age group. 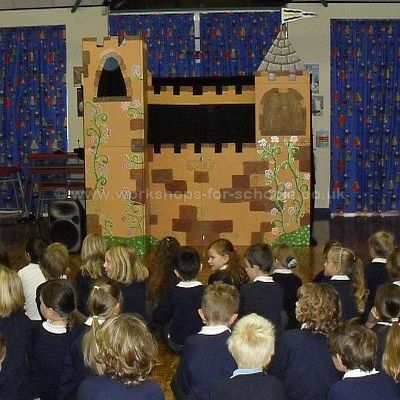 The children watch an entertaining and lively puppet show. 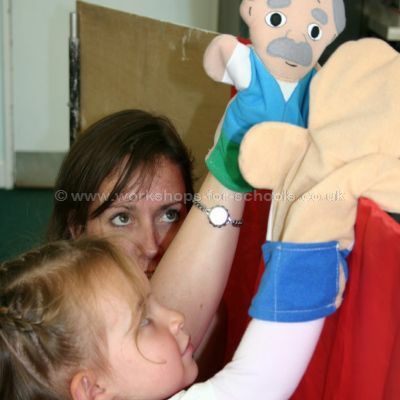 We take a look at the puppet theatre and how it works. The children learn how to bring a puppet to life. Everyone gets to make a puppet of their own which they can take home at the end of the day. The following are options which can be included if required. We also do a marionette day but making the puppet takes up much more time. Please ask if this is of interest. 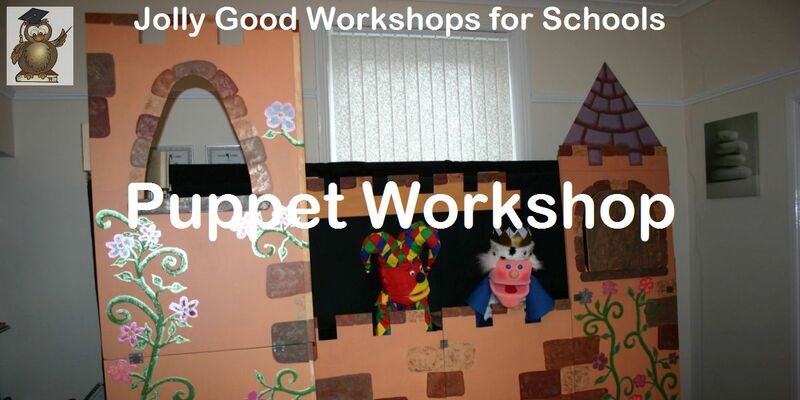 The Puppet Workshop Day can be linked to various topics such as Toys, Monsters, Traditional Tales, Castles and more. 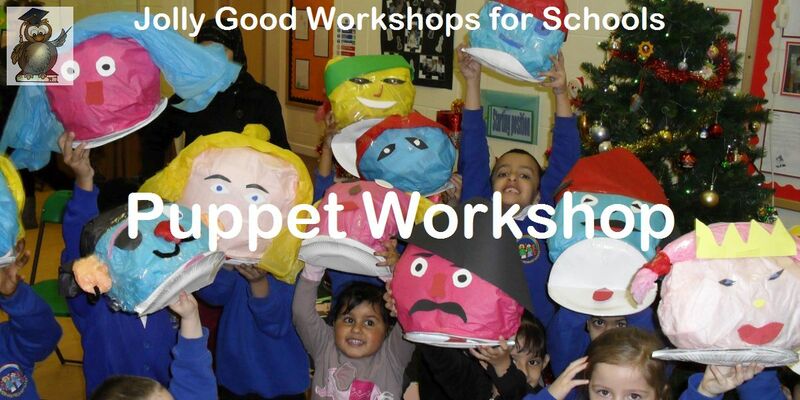 We can also switch the puppet making activity for making mini puppet theatres to link in with traditional tales. Please ask if interested. Learning to bring a puppet to life. Manipulation, characterization and voices are explained and demonstrated before the children have a go. 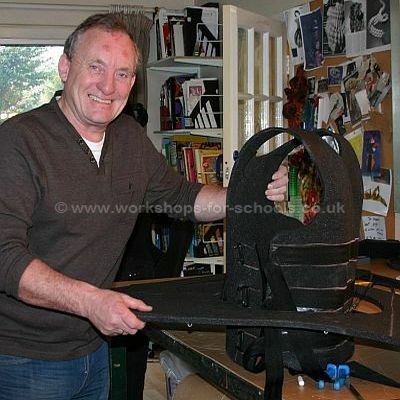 Ron making a foam body pack for a giant puppet suitable for use in a street show. 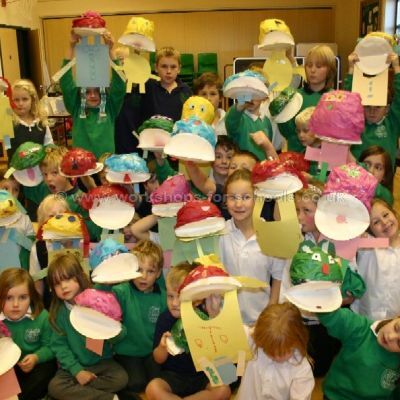 Puppet making is great to allow the children to express their creativity. We normally do puppet making in the afternoon on Puppet Day. Children showing off their moving mouth puppets. This is an option if we have plenty of extra parent helpers otherwise we make a simpler puppet. Children watching a puppet show. Our shows are very entertaining and interactive. The puppets are big and colourful. Teachers often comment on how nice they are. Ron demonstrating a marionette puppet. Making marionettes is fairly time consuming but we do offer a marionette day if requested. Ron carving the head of a marionette puppet. 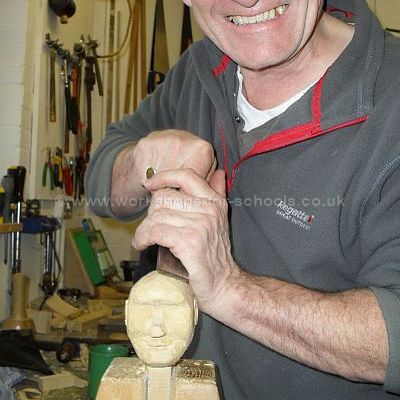 We don't do carving in school but Ron brings his tools to show the children on a marionette day. Children working in groups in the school hall. Each group has an adult in charge. These children are making moving mouth puppets. What age group can take part? 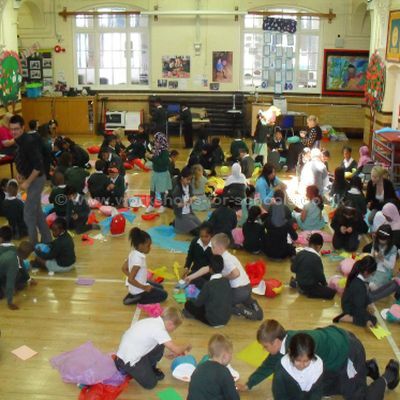 Puppet Day can be adapted to age groups from Reception to Year 6. What type of puppets do you use? Glove and hand puppets. We do also have some marionettes for use on a marionette day. Will the school hall be required? The school hall is better for larger groups but we can also work in a large classroom depending on numbers. The afternoon session can be in classrooms. How many classes can take part? Up to four classes is possible in a one day visit. Do we need extra staff? It is always useful to have extra help in the afternoon. 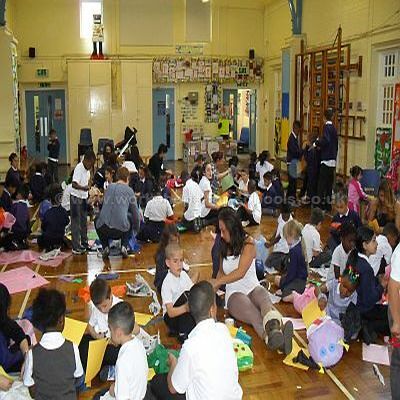 Some schools are very well supported and we get lots of parents coming in to help with puppet making. May: 6th*, 7th, 8th, 14th, 20th*, 22nd. June: 3rd*, 5th*, 11th, 12th, 17th*, 19th, 24th*, 26th. July: 1st*, 2nd, 3rd, 8th*, 10th, 15th*, 16th, 17th, 22nd*, 23rd, 24th. *We are unable to visit schools in the Midlands or South on Mondays. Thank you again for such an enjoyable and interesting day. We will definitely book again in the future! An exciting and engaging day was had by all of Key Stage One. 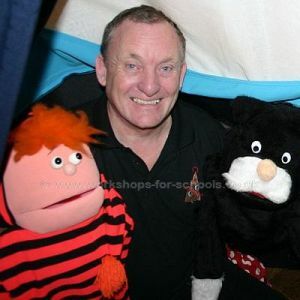 Ron's charismatic and humourous puppet show had the children hooked in the morning and they couldn't wait to make their own puppets in the afternoon. The puppet making was simple yet effective, enabling children to let their individuality and creativity shine through. Our children left school feeling proud and ready to show their puppets. Thank you Ron! A great day all round, children loved the show and the making sessions, which have set up our DT and English learning for the rest of the half term. super. St Annes school would like to thank Ron Wood for a fabulous Pirate day in the Spring Term. Adults and children in year 1 spent the day dressed as pirates. They learnt many facts about Pirate life and pirate history. They also throughly enjoyed watching the funny puppet show and creating an age appropiate puppet on the afternoon. Ron was a very friendly man and was willing to help us make some video clips about jobs onboard the pirate ship. These helped to engaged the children in our next history lessons. We will be definately be booking Ron next year. Thanks for a wonderful experience! The children really enjoyed the day and gained so much from all aspects of it. Ron was very accomodating and personable with the children. The puppet show and puppet making were well resourced and children were fully involved and engaged throughout. This is the second time that we have used Ron's company and we would definately do so again. Question: * Type the word for the number 9. © 2011-2019 Workshops for Schools Ltd.